In spring the wise woman who does not wish to be left behind in Fashion's race, plans many dresses for wear in the months of late spring and summer. Her trend of opinion may be towards a little trimming, and that of the best; handwork is always in the ascendant, and the best dressmakers make all their own embellishments, for well-dressed women do not desire to see their clothes duplicated, or to meet an especially successful ornament on the gown of a friend. Such exclusive needlework is not cheap; the couturiere must recoup herself for original ideas and the time spent in carrying out such by her workers. Here is an opportunity which the home-worker should not miss, for, with the help of a few suggestions such as are here given, an endless variety of exclusive trimmings can distinctive trimming at a modest outlay of time and money be made and the expert sewer can wear the result of her industry with a light heart and an undepleted purse, since she will have the satisfaction of knowing that what looks so handsome and unusual is the work of her own fingers, and cost but a trifle. In planning a dress, whether it be a light serge which needs garnishing on bodice and skirt, or the blouse which must match the coat and skirt exactly, the dye-pot comes in most usefully. 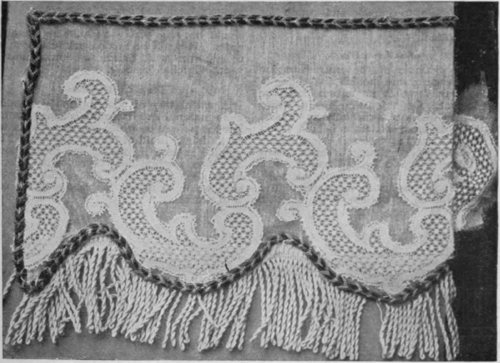 A remnant of coarse piece-lace, which is useless in its natural cream colour, is a very different affair when dyed to just the right tint of grey or mauve that is needed for the guimpe, and sleeves of a grey or mauve shirt-waist. Or, again, wide military braid may be used in a variety of ways, and, if well matched with a silken fringe, comes in for the handsome edging of a tunic in fine Navy serge. If the braid is further embellished with hand embroidery, so much the better. An example was recently seen with a row of French knots in thick emerald green embroidery silk. These knots were worked on the lower edge of the braid and exactly matched the colour of the green velvet edging of the black satin collar pendant half-way down the back. A narrow Greek key pattern is useful on many trimmings. It was worked in rose-flax thread on a wide coarse-meshed insertion. The embroidered design held its course all over the lace, regardless of the pattern on the transparency beneath. The effect was very beautiful and fittingly ornamented a graceful house dress of clinging rose and grey chiffon taffeta. If a trimming is satisfactory in itself, but lacks the right colour to make it tone with the material with which it is to be used, it is a good plan to match the stuff exactly at the embroidery silk counter, then either work over the trimming spots of the desired colour at regular intervals, or place them on the design in addition to the existing ornament. A simple way to achieve the spotting at regular intervals is to lay a sheet of postage stamps over the material to be worked; then mark with a pencil through the perforations at the corner of every stamp, seeing that the pencil point has penetrated to the stuff below. By this means a regular powdering is obtained. If the stamps give marks too close together or too far apart, fold a piece of writing-paper into squares of the required size, then snip a hole at each corner of the folds. Unfold the paper and spread over the material to be marked, using the holes as guide, just as the perforations at the corners of the stamps were used. Besides spotting, it is always easy to make lines or bars of special colours on an existing trimming. It is wonderful how little of this kind of work is sufficient to bring a piece of trimming into line with the colour of the dress. The keynote of all successful dressing is that the trimming, however much or however little there may be of it, should look as if it "grew there," or, in other words, as if it were specially made for the dress it adorns. We cannot all have trimmings specially woven for each dress, but we can all find some useful foundation trimming which, with a few added touches, may be made to go with the material to be used. In evening dresses the desired touch of colour may be added by means of the many coloured sequins. The example shown illustrates this mode in a very useful manner. A patterned net insertion is used as a foundation. The richness of this is enhanced by the addition on each edge of a narrow gold lace or galon. On this are sewn green sequins of curious shape. These occur at regular intervals on the gold braid, and are also used at much wider intervals on the cream lace insertion, so that it, too, is brought into line with the gold border, and a very handsome trimming is the result. It is of exclusive pattern and a useful width. Thus, by ingeniously placing together two inexpensive trimmings, an effective result is obtained. This idea might be carried out with equal success if a black transparency were used as the central insertion, one suitable for trimming the bottom of a tunic. Sew on either edge an inch-wide edging of tarnished silver, place brighter silver sequins at intervals on the metal edging, and also as central ornaments on some of the black lace patterns. A handsome trimming will thus be made at a very small outlay. Sequins may also be used to outline a wide pattern traced on to strips of different-coloured materials. A white lace insertion was seen edged on either side with palest mauve-shot ribbon. The lace was three and a half inches wide, the ribbon two inches, and the scroll pattern in silver sequins was seven inches wide, so that it was worked over the lace and ribbon at either edge, regard of the varying material that supported it. This trimming was used not only on a skirt, but also formed the chief part of the bodice ornament, and entirely composed the elbow sleeves. It is only the expert who is fearless with the scissors; the amateur is too often overwhelmed with responsibility with regard to a ready-made trimming, and fears to cut what looks so complete and finished. In order to make an exclusive trimming which matches a dress exactly, all fear 01 using the scissors must be banished. By cutting here and there, and using what is wanted and no more, original trimmings are achieved, and the conventional decoration used by everybody is avoided. Let us take an example. A four-inch-wide military braid shall be the foundation. This is edged with a six-inch-wide black silk fringe, handsomely knotted. Then a useful insertion, dyed a very dark mole colour, is sewn to the top edge, where the fringe is joined to the braid. Such a trimming gave distinction to a very handsome travelling wrap in a trousseau emanating from one of the smartest of ateliers. There is no reason whatever why a bride of little worldly wealth but endowed perchance with skilful fingers and quick inventive mind should not achieve a garniture, if not as costly at least as becoming. There need be no slavish adherence to the particular model described, an adaptation might well be equally successful. Here is the idea: let the cunning needle-worker make it her own; it will be found capable of a great variety of interpretations, and when the garment adorned by such a garniture has seen its best days or has fallen out of favour for any reason, it is always possible to unpick and retain for future use the trimming which lent it its chief attraction. Another example of the fringed border which is so useful and modish for edging is in fine grass lawn in its natural fawn or stone colour. On this was laid a white lace pattern which was carefully appliqued, and then the lawn cut from behind it, so that the lace had the desirable a iour effect. On the vandyked lower border of this was sewn a flax-thread fringe in twisted cord exactly matching the grass lawn in colour. A very distinctive note was added by sewing at the top edge, and as an outline to the scallops a narrow silk Russian braid of bla:k and orange with a tiny black-and-white thread run through it. This uncommon and strange addition gave just the original note required. It is thus the clever worker puts in a mark which arrests the attention and makes for success. Grass lawn and fringe is pretty on any washing dress, but with its black-and-orange note, it is worthy of special attention. A simple but effective border is made of a two-inch-wide lace of Saxony make in vegetable silk, which has a pleasing and bright effect. 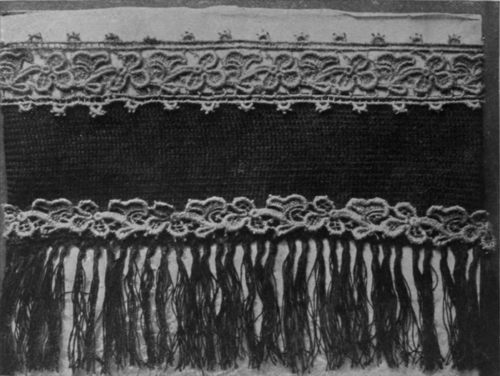 This lace is of the colour of old ivory, and is edged with an ornamental braid in the same colour, having lines added in moss-green and bois de rose colour. The effect is extremely delicate and artistic, and would be very pretty on an early summer dress. It could be carried out in any make of silk lace with braid, the main lines of which matched exactly. A useful way of effecting unity between main material and trimming is simply to follow the pattern on white or cream lace in any small dainty braid of the right colour. This method is seen in one of our illustrations. The fine torchon insertion destined for a little girl's frock has rose braid daintily stitched on to match the rose serge frock it is to adorn.